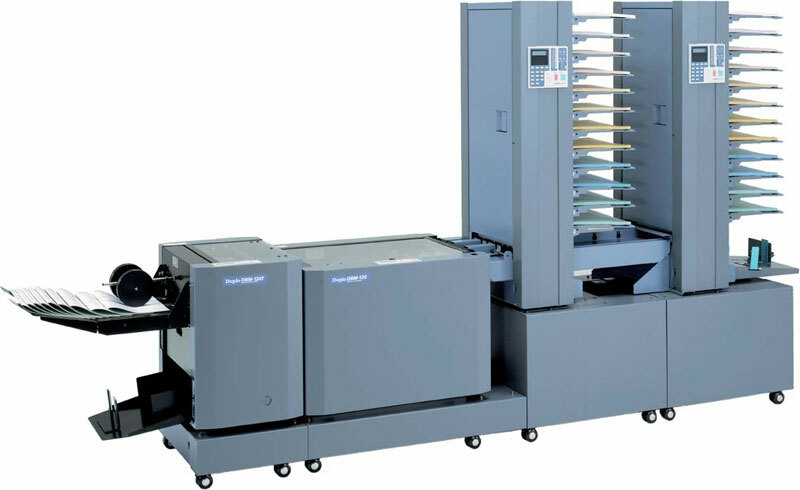 The Duplo DBM120 Dynamic Booklet Maker is a highly versatile booklet maker capable of standalone (hand-fed) operation or connection to a choice of friction feed collators. With an operating speed of up to 2,400 booklets per hour and most of the setup is automatic making this a perfect machine for short-run production. Production speeds of 2,400 A5 booklets per hour are possible when online to a Duplo collator. Productivity is further maintained by the high level of automation in the setup process which ensures minimal manual intervention. A built-in corner/side staple facility allows the operator to perform these functions without removing attachments further improving overall productivity. Changing between different booklet sizes takes just seconds. Simply make the selection on the control panel or recall one of the 13 memories and the DBM-120 will automatically move the side guides. 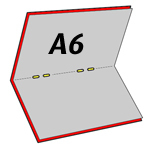 The staple positions can be moved manually if required. 20 sheets of 80gsm paper can be handled making A4 booklets from 8 to 80 pages long! The machine will automatically staple to the correct depth once the operator has input the number of sheets into the machine so a strong bind is assured no matter the thickness. The DBM120 is capable of side stapling, corner stapling, folding and saddle stitching so just about any finishing requirement is possible. A fine adjustment mode allows for correct positioning of the staple, fNEW and trim positions which can be stored for future recall in any of the 13 memories. In addition, staple heads are fitted with "out of staple" sensors to prevent unstapled booklet errors. When producing thicker books it is often necessary to trim the wide edge to ensure the booklet has a flat finish. The Duplo DBM120T is an optional trimmer unit that will cut this edge as the book is ejected from the booklet maker ensuring a more presentable appearance. As standard, the Duplo DBM120 is capable of producing booklets from A3 to A5 in size. The optional small booklet kit enables the DBM120 to handle sheet sizes down to A5 to create MINATURE booklets as small as A6 (finished size).